I'm starting to think Karl Lagerfeld got a hold of my alma mater's slogan, "got pearls?" I actually had that on my license plate for North Carolina for as long as I can remember. Yes, I was that obsessed with the idea that pearls were meant to be a part of everyday life. Pearls never ever go out of style, ladies, and this season Uncle Karl is proving that they're more on trend then ever with his spring summer 2013 collection for Chanel. He had then on dresses, wrists, necklines and even in the hair of his models. This will inevitably be as big as the time he branded his models with double-C tattoos for a Chanel show. Expect a sell out and lots of rip offs for the new season. 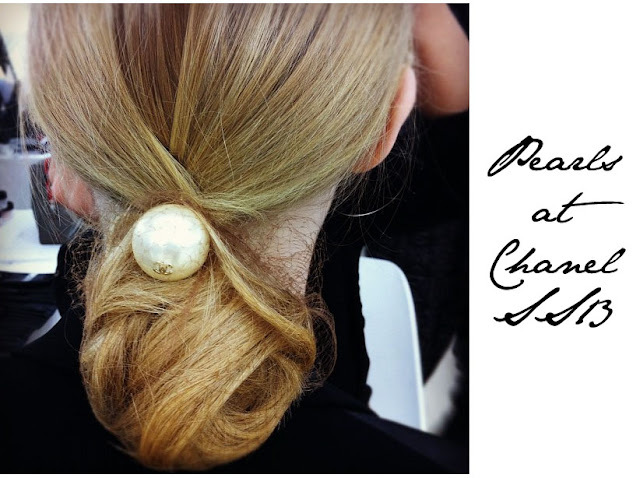 For now, we're just enjoying the idea of pearls being back in a major way for the masses.